First, the light guide of the light guide plate needs to be cut into a suitable size specification, and the size of the light guide plate must be smaller than the size of the outer frame, and at the same time, some extra positions are reserved for the LED lamp beads and the ballast. After these are done, the end face of the homogenizing plate needs to be polished, and the entire light guide plate is completed. Secondly, a double-sided tape is applied around the four sides of the homogenizing plate, and a reflective film is attached to one side of the homogenizing plate. It is best to choose a white PET reflective film. Third, the two sides of the light plate need to use a reflective film to report the fluorescent tube. If the crystal light box is relatively small, you can use the LED light bar. Fourth, connect the ballast, and put the light guide plate, LED lamp bead and ballast in the bottom frame of the light box. In order to facilitate the replacement of the lamp, the frame of the light box can be replaced with an open type. The frame is generally made of aluminum alloy, stainless steel, wood, plastic, etc., which can be selected according to your own preference. Fifth, the last step is to put a light sheet on the light board on the light guide plate, and add a transparent plexiglass panel, cover the outer frame, and fix the frame, so that the crystal light box is completed. 上一页：What kind of ultra-thin light box? 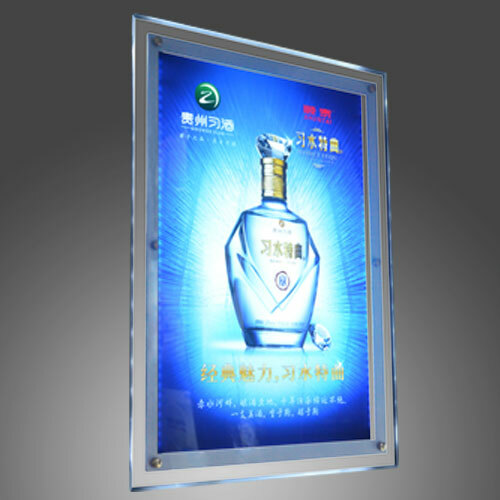 下一页：What should you pay attention to in the late stage of ultra-thin light boxes?